The XL200 is an industrial controller specifically designed to be the ultimate in roll forming machine controllers. Through software selection and configuration parameters, it can easily be adapted to any machine type and offers accuracy, efficiency, and ease of use. 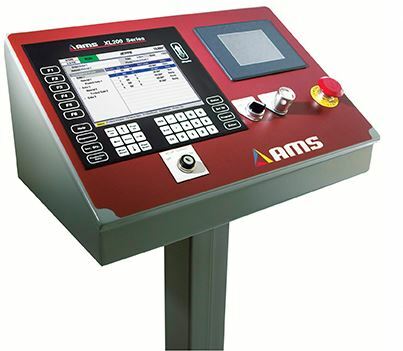 With over thirty-five years of experience developing, building, installing and servicing the roll forming market, AMS Controls has crafted a machine control system that has the control logic pre-written for the user. Complex algorithms for precision control of servo-positioned tooling or material, time-consuming and difficult calculations for complex punch progressions, and formulas for correcting length and press timing operations have all been pre-programmed and integrated into the XL200 roll forming controller. Taking a step beyond machine control, the XL200 was designed to allow integration of the shop floor with the sales office. Coupled with the Eclipse Production Management Software, the XL200 can receive orders downloaded from your company ERP system. As production is run on the machine, real-time updates are sent back to the office for order completions, as well as pre-formatted reports on production rates, scrap and good material, coil inventory updates, and a host of other variables that are tracked by the system. These features eliminate mistakes, improve productivity,and provide valuable information to show what is really happening at the machine. AMS Controls has a staff of experienced and knowledgeable experts who are prepared to consult and support customers in a wide range of industries that utilize the roll forming process. AMS Controls is familiar with the needs and requirements of customers from the high precision of aerospace to the high speed production rates of metal building component manufacturers.